I’m not sure what it is, but it seems that Fantagraphics is reading my mind about collections to publish. After reading the excellent Drunk, Stoned, Brilliant, Dead by Rick Meyerowitz about the National Lampoon — featuring some of the best work from the main contributors — I’d been hooked on the couple of Nuts strips by Gahan Wilson they reprinted. And, sure enough, in 2011, Fantagraphics released a brand new collection of ALL the Nuts strips in a gorgeous volume. Perhaps what stood out to me was that Nuts, at least at first glance, seemed a bit different than both what the Lampoon and Wilson were known for. Wilson’s best known for gag strips in the vein of a darker Charles Addams, and the Lampoon was often described with the word “cynical” — and sometimes even “mean-spirited”. Nuts, on the other hand, can be described as a riff on Peanuts (complete with a side-character named “Charley Browne”)… but that honestly, doesn’t do Nuts justice. 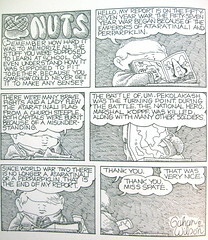 Nuts isn’t a parody of the strip, but rather, uses some of its language (unseen adults, “camera” positioning from a low, child’s eye view) to comment not on adulthood and morality like Schulz’s strip, but childhood itself. The result is a memoir-like piece about, ultimately, how scary childhood can be. Nuts isn’t scary, however — not in a monster sort of way. Rather, the fear comes from not being able to quite tell what’s going on. Wilson’s strip is dense and wordy, but in an artful way that doesn’t detract from the strip. There’s no sense that he’d rather be writing an essay (like you get with some particularly wordy strips) — it’s just that he’s using the precise amount of words he needs, and if that happens to be slightly more than most people are accustomed to seeing in a comic strip, so be it. The over-arching theme is the question the unnamed main character asks himself in different strips — what if I don’t end up as a proper grown-up? What if I grow up, but I’m not all put together? What do I do then? And it’s a very real issue — and one that never really goes away. Even as adults, we still wonder if we’re “all put together”. And you get the feeling that the main character likes to think that once he hits adulthood, he’ll have it all figured out… but he also doesn’t actually believe that to be so. But a kid has to have hope, right? 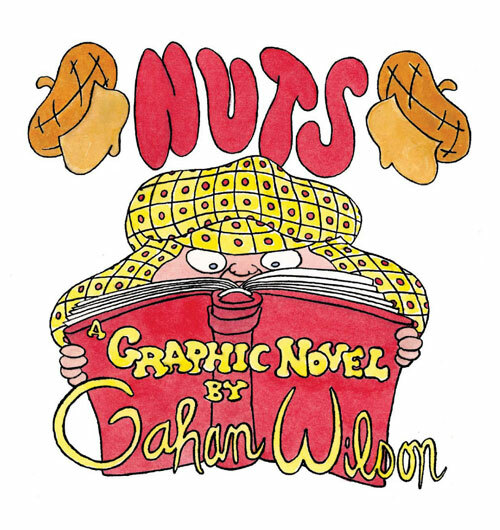 Gahan Wilson’s a major talent in comics, and thanks to Fantagraphics, we now have a volume of the until-now hard-to-find Nuts strips — and can revisit them and see how much Wilson understands the truth of childhood… and adulthood. And, well, basically what it is to be human. What it is to grow and learn. What it is to face the ugly things of life when we’re not ready for them. What it is to realize that we’ve got a past that “would continue to pile up”. Fantagraphics Kickstarter a Huge Success – But Should Be Seen as an Argument Against OGNs?